Whether you’re thinking of refitting your bathroom or building an en-suite from scratch, our in-house Project Manager can organise and coordinate all the trades for you. 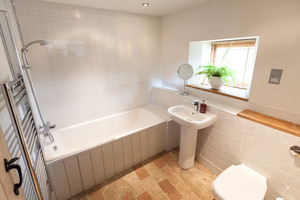 Did you know that you need the same amount of trades for a simple bathroom re-fit as you do for a single-story extension? Once you’ve worked out the optimum bathroom plan and chosen the sanitary ware, you’ll need to find: electrician, plasterer, carpenter, tiler, floor laying specialist, decorator and of course a reliable plumbing and heating engineer! That’s a lot of people to contact, invite round for quotes (if they turn up! ), negotiate costs and timescales with, coordinate amongst other trades and re-schedule, if and when things change. How can you be sure they’re going to turn up when they say they’re going to? How do you know their quality of work is going to be good enough? Aqua Plumbing & Heating Ltd have been doing bathroom re-fits in and around Lymington and the New Forest for over 25 years, only working with a team of reputable and trusted trades whose quality of workmanship matches the standards our customers have come to expect from us. Our friendly Project Manager is dedicated to organising this type of project work. So, you benefit from dealing with one contact rather than 7! She’s in regular contact with all the trades, coordinating their work days, so she can send customers an up to date schedule of works at any time. This details what work is going to happen on which day. This advance warning means you can plan ahead accordingly. You’ll know exactly which trade to expect on what day and know in advance what they’ll be doing. Also, if there are any specification changes which might alter pre-scheduled timings we can send additional quotes and revise the schedule accordingly. Our aim is to cause as little disruption to your day as possible. It’s all about getting the right people in the room at the right time! What could be simpler?